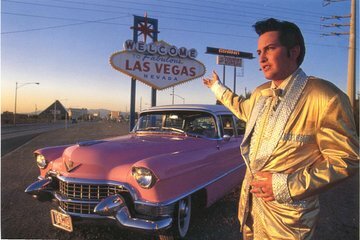 See the sights and sounds of the famous Las Vegas Strip on this private, 1-hour tour with Elvis in a 1955 pink Cadillac convertible. Visit three iconic Sin City locations, including the Welcome to Fabulous Las Vegas sign. The tour features an accompanying professional photographer who will take pictures of the group and the many colorful sites along the way — over 100 photos in all. It’s memorable introduction to Las Vegas for up to five guests. Local hotel pickup and drop-off included. Please advise of preferred time in the Special Requirements field at the time of booking.